In the opening scene of Arachnophilia, Conor (Harry Butler), a fragile-looking but enthusiastic young man, leads his girlfriend Alice (Meg Healy), eyes covered in heightened expectation, into their shared apartment to unveil a surprise gift. Romantic comedies often lead viewers to the kind of climax that seems on offer here but playwright Aidan Fitzmaurice, a man clearly very much at home with the absurd, has other ideas. We soon realise that Conor, much to Alice’s chagrin, has a very different proposal in mind. Her present is a Perspex cage containing a Chilean rose spider Conor has named Bellhop, a “pet” he has bought for her in the hope that it will help them overcome their anxiety at the prospect of having a baby. Alice, who not only is disgusted by the gift but does not even remember having ever had a conversation about starting a family with Conor, expediently and in no uncertain terms rejects not only the offer but the very notion of sharing her life with a man who could conceive of such a pre-parenting plan. Alice’s departure is also the play’s departure from narrow realism and an opportunity for the audience to accept Fitzmaurice’s wildest gift: not only will Bellhop (Ian Dunphy) claim his share of the stage and more than his share of the lines in Arachnophilia, he will do this in the company of his exoskeleton, which the playwright turns into a philosophical and lippy imaginary friend due to the dearth of stimulation and companionship of Bellhop’s new circumstances. Given that Arachnophilia revolves around the increasingly complex relationship between a man and his spider and a spider and his exoskeleton, there is hardly any need to vindicate the bold comedic vision displayed by its author. Fitzmaurice establishes his zany material and then confidently runs with it for the next hour, showcasing an admirable ability to draw from a rich array of comic sources including vaudeville, situation comedy, clowning and the absurd. The script is seasoned with clever wordplay and allusions that take it beyond its hilarious set up. At one point Bellhop ponders the possibility of a Pixar adaptation of his relationship with Conor, only to dismiss it as it would only work if it were a tale of “a spider talking to a pig”. Elsewhere, the spiders refer to the film Arachnophobia as being akin to a “hate crime”. By drawing our attention to the two genres where spiders are usually known to serve a dramatic purpose, namely fable and horror, the author cleverly highlights the uniqueness of his conceit. In truth, Kafka made satirical use of an anthropomorphised bug and Bellhop and his exoskeleton, forced to keep each other company as they seem doomed to endlessly wait for a change of circumstance, have a passing and pleasing resemblance to Beckett’s tramps. This is not to detract from the author’s inventiveness but to suggest that this play does not shy away from nimbly nodding in the direction of existential concerns. Sarah Bradley’s production at The New Theatre supports the freshness of Fitzmaurice’s material very simply and effectively: the stage is divided into human and spider sides separated by an invisible wall. The tatty and generic furniture of the human dimension contrasts with the bolder design on display on the spider’s habitat, suggesting that the spider and his friend enjoy a more attractive prison cell than their human counterpart. Elsewhere, pinstriped pants cleverly bring to mind the lines of a spider’s web, and shades, the multiple eyes of the creatures that spin them. 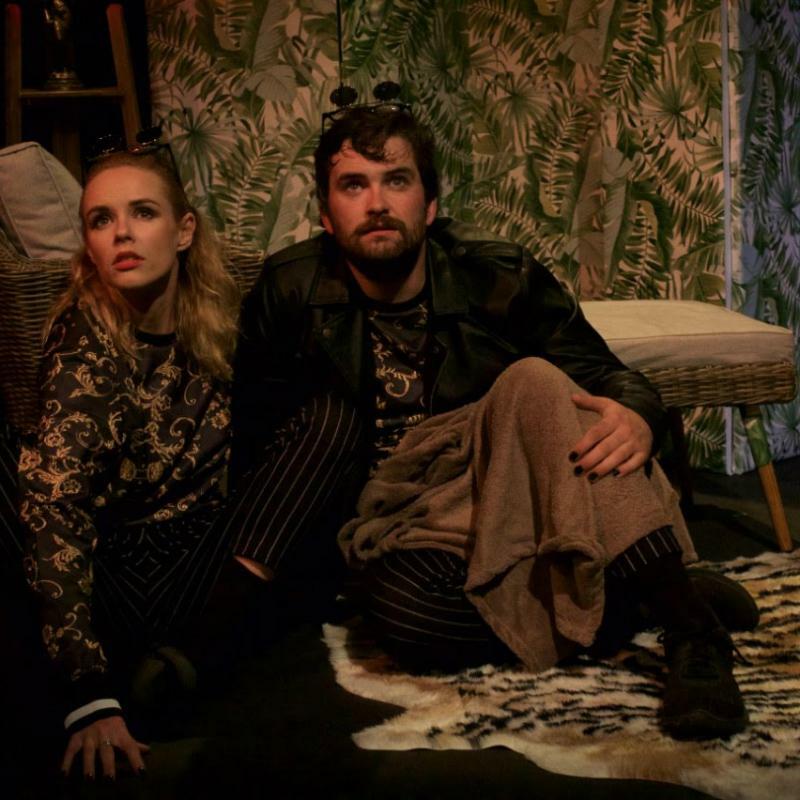 The cast are all convincing and competent comic actors: Harry Butler composes a breezy obsessive in his performance as Conor and Meg Healy, whose Alice is in turns stern and sympathetic, provokes some belly laughs in her second role as a grasshopper trying to save his life through sheer moxie. For their part, Ian Dumphy and Caoimhe Mulcahy deliver their lines as embattled cellmates with flair and aplomb. Their lively talent for physical comedy and their buddy chemistry are the backbone of this production. Arachnophilia is back on stage by popular demand after its initial stint at the Dublin Fringe last year. Go see it, as one of its songs says, it is sure to “spin your face from a frown to a smile”.